This is so unlike me but I bought a Scarlet Sentinel columnar apple tree without pre-purchase research. Now I'm having trouble finding much reliable info about it. Someone said it doesn't taste good but at the same time said no apple is any more disease resistant than another, which instantly made me question the validity of any statement. 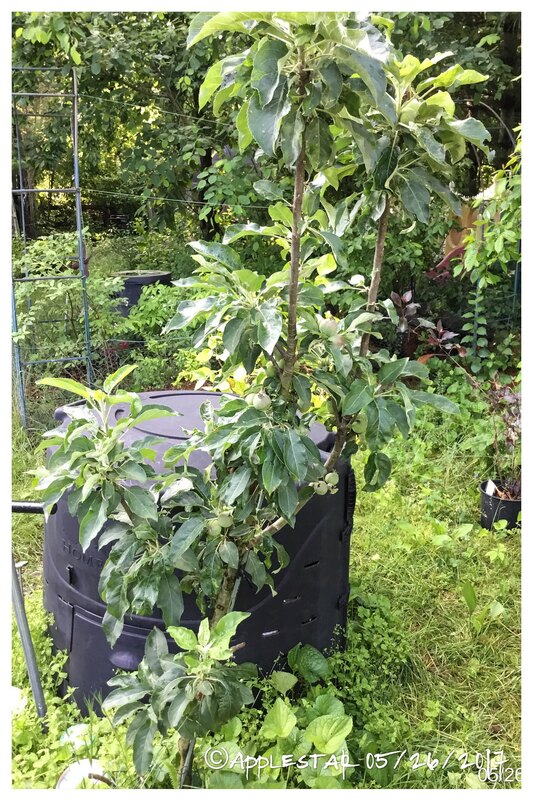 I gave up after the last website claiming to be all about apple cultivation said it's self pollinating but should be planted with other trees - even cherries or peaches. I'm pretty sure the articles and descriptions claiming to be self pollinating were written with inadequate research and are mistaking Scarlet Sentinel which is supposed to be a regular apple (needing cross pollination) with Red Sentinel crabapple (self pollinating). So, I have to decide if this Scarlet Sentinel should go on one side of the house near the semi dwarf Enterprise with a wild crab apple towards the back of the property (which is most likely pollinating the Enterprise) or on the other side of the house near the espaliered Pristine and Arkansas Black. Unfortunately, there is no room in the espalier fence row or I would definitely have planted it there, but I could plant it nearby. Enterprise side is relatively close to the neighbor's Eastern red cedar trees and even the super disease resistant Enterprise suffers cedar-apple rust on some of the leaves, and an Amelanchier that I thoughtlessly planted between Enterprise and the wild crab loses most of its fruits to it, though its foliage appears immune/able to fight it off. Any ideas or help locating reliable info source would be greatly appreciated. The EARLY SEASON bloomers and the LATE SEASON bloomers wonÃ¢â‚¬â„¢t cross pollinate because their bloom time is too far apart and the early varieties will be done blooming before the late ones start. It is best to pick a pollinator in the same half of the total list. The closer the two varieties are in bloom time, the more their bloom will overlap and the more likely you will get pollination and therefore fruit set. What is important is to choose a pollinator that is not too far in bloom time from your variety. For instance Liberty and Dayton are close enough to count on for pollination whereas Liberty and Fiesta are far enough away to often work, but not always. Zestar and King Edward would rarely if ever overlap in bloom. While the bloom order stays generally similar in different parts of the nation and in different years, the actual bloom dates change year to year depending on the weather. If one of your other apples falls between late end of the Early varieties and the early beginning of the Mid varieties, one would think your all right. The one trouble Star with Columner trees is that they have not quite cracked the flavour market yet. There are a few better ones getting around but you do sacrifice taste for convenience somewhat. If you have a malus in your garden then pollination shouild be no problem. The pollen on the crab is viable for a far greater period than general apple vars. As you say the Scarlet is not self-pollinating. though I think it has Golden parenting somewhere in its genes so it should be prolific. As far as I can find it has poor desease resistance so will need protecting. This will give me a chance to explore other varieties that will bloom at the same time to pollinate well but will mature at other times to spread out the harvest. I have the really early Pristine and really late Arkansas Black, so I want some others in between. JONA, thanks for checking around. I think this means I should plant it where I can really keep an eye on it. Its shape gives it more options. Do you suppose columnars are "ideal" for the cordon style espalier? ...or since it IS possible to do that with other cultivars, one might as well choose known well flavored cultivars? There are so many vars that you can use and with far better flavour. Also with the dwarfing stocks available keeping the size down is no problem. I have had a North Pole columnar apple tree for about 10 years. It has produced fruit nicely (and beautifully!) without another columnar apple anywhere in the neighborhood. I do have a Lodi and a Northern Spy tree nearby. My conclusion is that the columnar apples (or at least North Pole) do not need another columnar apple for cross pollination, that any other apple tree that can pollinate another tree will do. This only makes sense! Apples is apples!!! Any of the malus species will do the job providing it is not a triploid. Ah ha! Time to post an update! Here is the Scarlet Sentinel. So tiny in height and width that I can see why this is suitable for container culture. I think it liked having the compost bin next to it last year and this winter -- that and maybe fortuitous weather conditions at fruit set -- though I will be moving it (the compost bin) elsewhere soon. ...But I failed to keep up with its training and now it has two leaders. Haha so typical of me when the whole point is that it grows in a column all on its own...but I'm inclined to keep both leaders unless it could be potential for trouble later. (Too bad they are not intentionally trained and shaped split -- I believe the textbook shape would look like a tuning fork). I think those bottom two branches -- one sticking out to the left and another one straight towards the camera angle should come off ... and the whole thing is leaning a bit -- I'm thinking it should be pulled over with a guy wire? ...or maybe it needs a sturdy stake? Any advice would be very welcome before I start chopping. Should I prune now-late summer-or-next winter? I'd leave them both and see what develops. No need to summer prune as there is not that much vegetation. Do it in the winter when you can see clearly how the tree is shaping up. Thanks, JONA. I will come back to this at winter pruning time.